When it comes to body positivity, society still has a long way to go. Luckily, many celebs are using their influence to help the movement in incredible ways, and Demi Lovato is no exception. The pop singer recently took to the internet and did something that will truly inspire girls who are tired of needing to put makeup on to feel good about themselves: Demi Lovato posted a photo of the second face on her neck wearing absolutely no makeup. So beautiful! Her second face is perfect, makeup or not! 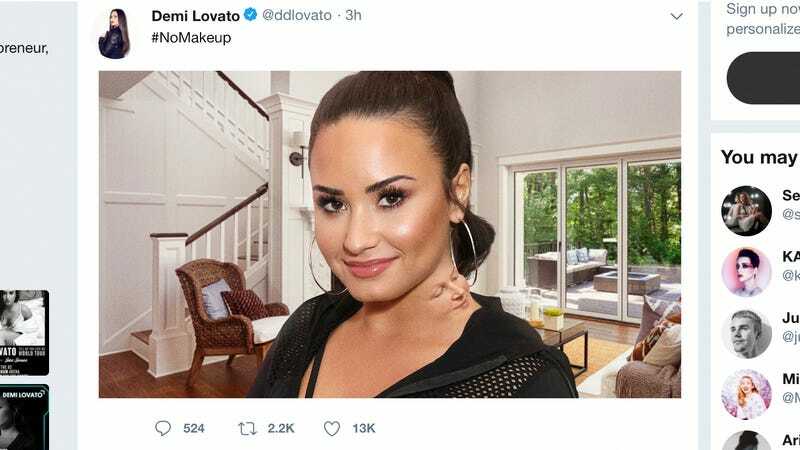 Yesterday afternoon, Lovato posted the image of her au naturale second face to Twitter, where it was met with a tidal wave of love from her fans. No eye-liner, no lipstick, no foundation—just the face protruding from Demi’s neck in all its natural beauty and imperfections—pimples, wrinkles, the second face’s bushy unplucked eyebrows and everything. Without a doubt, thousands of Demi’s young fans are seeing this makeup-free selfie and realizing that the small, androgynous human face on her neck that never stops screaming or secreting bile doesn’t need layers of concealer to be positively radiant, and neither do they! Demi, you and your second face are knockouts. You go, girl! Wow. There’s reinforcing the concept of having a positive body image, and then there is truly letting you and your second face be vulnerable in front of the entire world. What a great role model Demi Lovato is for young girls, and all people who let unrealistic standards of beauty stand in the way of loving themselves. Kudos to you, Demi!